Chuck T's. I've got mine...where are yours? At least 60% of all Americans own or have owned at least one pair of these in their lifetime. There have been over 750,000,000 sold. They were to be the first mass-produced tennis shoe in North America, originally available in one color (black) when they came out in 1917. By 1921 a young Akron Firestone joined the sales force, promoting this shoe across the nation. He was known to America as Charles Chuck H. Taylor. In 1923, his signature was added to this classic sneaker by Converse for his invaluable contributions to the shoes marketing and design. If you havent guessed by now, I’m talking about the Chuck Taylor Converse All Stars, arguably the most popular sneaker in history. Today, you can find chucks (as they are lovingly called by their loyal wearers) everywhere from the silver screen to your television. Even musicians have hopped on the chuck wagon. From Blondie to the Donnas, and the Ramones to Incubus, Chuck Taylors are seen in almost every decade since the savvy sneaker made its debut near the turn of the century (20th century, that is.) But Chuck Ts werent always this popular. Basketball was becoming a commonly played sport in the States. To accommodate this Converse designed the All Star as a shoe that could be worn comfortably during game play. When the shoe first came out, the public didnt showed much interest in it. Even worse, neither did basketball players. But Chuck Taylor saw potential in the shoe, and after the combined efforts of Taylor and Converse, the All Star became one of the most fashionable and functional shoes of the century. Converse even began manufacturing a white high top model as well. Currently, Chucks come in six core colors (Black, Navy Blue, White, Optical White, Red, and Monochrome Black.) However, each year Converse chooses what they call seasonal colors. These are chucks that will be available on a while supplies last basis. Current seasonal colors include Simply Taupe, Purple (different than last years Rage Purple,) Carolina Blue, and Celtic Green (brighter than the previous Oil or Sea Foam Greens.) Also included in the Chuck Taylor arsenal is your choice of pink, baby blue, gemstones, two-tone, and the extra high red bandanna. There are also Chuck Ts with prints on them. This would include the Hawaiian print All Stars, the Flame, Stars and Stripes, and Leopard Print. Allergic to canvas shoes? Have no fear. Chucks come in brown and black leather and brown/blue/black corduroy and suede. Not to mention the silver flash and other denim versions. All core colors (and some seasonal colors/prints) come in three different styles: Mules, which have no back so you can slide them on like sandals, Oxfords, which are a low top sneakers, and High Tops. Youll specify which version you want at time of purchase. A buyers tip: If you see a pair of seasonals, buy them quickly. They are usually produced for only a year, and they go fast. Not sure if you have what it takes to pull off the neon orange All Stars yet? You dont have to. 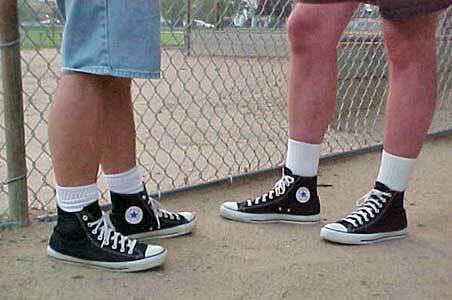 The most commonly seen style of chucks happens to be the classic black high top, which can be seen anywhere from that garage band next door, to Simple Plans video for Addicted. With so many colors and styles to choose from, there really is a Chuck T for every different mood and occasion. Id even go so far as to say theres a pair of chucks out there for every person, and a person for every pair of chucks. Ive got mine. Where are yours?